In need of a classroom to rent? 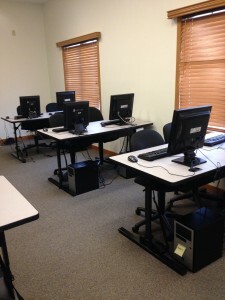 CEI has 2 classrooms that are available for rent. Each room is equipped with High-End Computers, in a fully networked room. High speed Internet access along with White boards, overhead projector and instructor PC are also included. The most popular applications are installed with access to different versions of Windows and the applications. There is a break room and sitting area available for the students. One class room has 12 PC’s in it and the other one has 9 PC’s. Call CEI for pricing and availability.